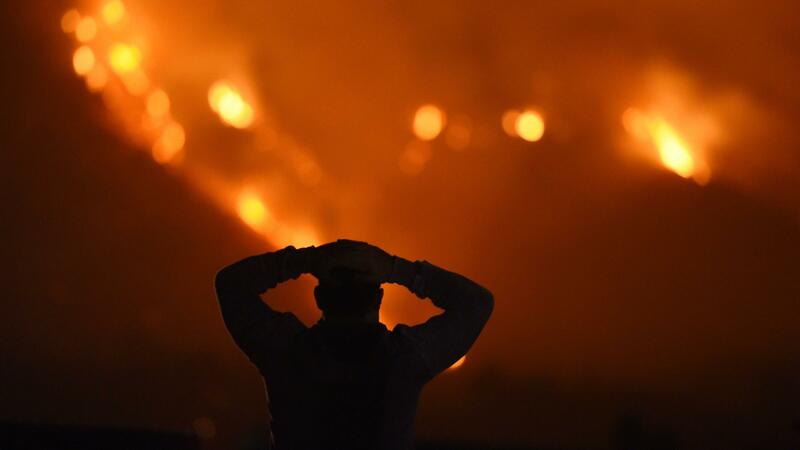 A man watches the Thomas Fire in the hills above Carpinteria, California. We can't expect firefighters to control, let alone put out major fires like the Thomas Fire. It's forced thousands to evacuate and destroyed close to 700 homes in Ventura and Santa Barbara counties and has quickly become among the top five largest fires in California history. Of the top 10 biggest fires, eight have occurred in the last 10 years. The Thomas Fire is what experts are now calling a mega-fire. It's fueled by ongoing drought, extremely low humidity and Santa Ana winds that make it nearly impossible for firefighters to stop. Often it's been too dangerous for crews to drop water or retardant on it from the air. At best, they can focus on steering the flames away from structures. But even that has at times been too dangerous. Only a major rain and snow event will stop it. "Temperatures haven't dropped as much at night as they did years ago, which keeps the humidity low and allows the fire to rage through the night rather than 'laying down,'" says Michael Kodas, a fire researcher at the University of Colorado. He says that in the past firefighters made headway overnight and early in the morning. One of the most immediate culprits behind the Thomas Fire's impressive growth is the Santa Ana winds. It's not unusual for them to blow this late in the season. But historically this region would have had some rain by now. Climate scientists believe that warming ocean temperatures are making high pressure systems more frequent along the West Coast. These can serve as storm deflectors, if you will. They also keep temperatures well above normal, if "normal" is really even a thing anymore. What sometimes gets lost in the flurry of TV coverage showing dramatic images of wildfires is that for more than a century we've suppressed naturally occurring wildfires in California and the West. This has led to an unnatural buildup of fuels. Most forests and shrub lands, including the chaparral-covered hillsides in coastal California, are considered fire dependent. They need fires for regrowth. Fire ecologists say we've tried to remove fires from the ecosystem, and the unintended consequence has been even larger, drought-fueled, human-caused fires. All of this is exacerbated by climate change. NPR Correspondent Eric Westervelt, on the scene of the Thomas Fire this week, reported that some brush land in the Thomas Fire's path hadn't burned in 70-100 years. "There's lots of built up fuel, and that's a big worry for firefighters who lost ground to the massive Thomas Fire over the weekend," Westervelt told Morning Edition. Historically, most wildfires were suppressed to protect timber assets, including in the Los Padres National Forest near Santa Barbara and Ventura. More recently, aggressive fire suppression has occurred with an eye toward protecting homes and property. In the past couple of decades, there has been an explosion of development in high fire-risk areas. There's a term for this in the firefighting world: the WUI, pronounced like "wooey," short for wildland urban interface. In states from California to Arizona to Washington, cabins, vacation homes and increasingly whole towns and even cities are spreading into forests and wildlands. Just take the example of the Thomas Fire. Reporter Stephanie O'Neill told All Things Considered that a similarly sized fire in the same area in 1932 burned only one structure. By contrast, this week's fire has burned 800 structures and counting. Consequently, that's why we've seen the number of homes burned from each bad fire to the next going up, sometimes in alarming fashion. In October, seven wildfires in Northern California's wine country destroyed more than 8,800 homes, a record in California. Several of these blazes started as wild land fires and burned into established, urban areas before anyone could even try to contain them due to the dangerous conditions.